" The saying “it’s the little things in life,” is something that can very easily be applied to tennis. Tennis is a game of small adjustments and tweaks. Players today are looking for anything that can enhance their game. Knowing this, String Advantage has created the Pojie Performance Extension." " When you’re out there hitting with Pojie installed, the ball will sit on the strings longer which will result in more power, more spin, more confidence, and will amplify comfort for those who have struggled with arm issues. Without a shadow of a doubt, I was getting much better play from my tennis racquet with Pojie installed. I was getting much more controlled power on my groundstrokes. I could feel the ball sitting on the stringbed longer, this allowed me to make micro-adjustments as I needed. The spin production was better, not significantly more, but enough to where I noticed that I was getting getting more kick from my strokes. " 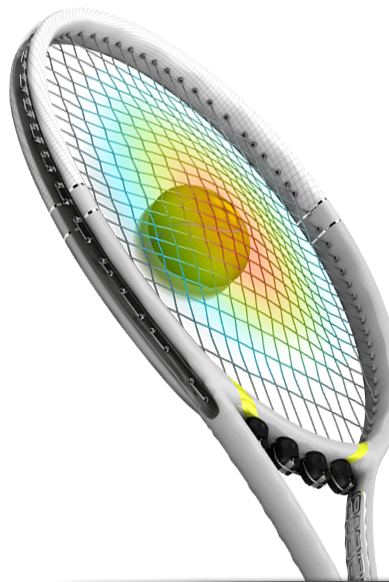 " Pojie is a new product that might make a big difference in your tennis game. Yes, it's legal and in fact, have already made an appearance at the US Open and in NCAA play. Simple to work into the stringing process, Pojie's four little racquet add-ons increase your racquet's sweet spot, add spin and improve control. They can be installed in any size frame. " " I took them to the court to try them out with my wife today. I wasn't sure because I already have a full gut setup at low tension, whether I could really tell a big difference between them or not. But I was surprised that I could. The one without the Pojies has always been nice and sweet. But the one with the Pojies feels even nicer and sweeter. More pop on the ball, sweet spot seems bigger, mostly positive feeling over all. " " I felt that when i had played with the Pojie i could produce much easier power, as well as that I thought that I was able to take the ball much earlier and really step into the ball, which gives me a huge advantage to approach the net... my slice and serve were two other aspects of my game that truly felt the change and I could really hit through my slice and that it would not float or go into the net…my serve had much more power and kick. I believe that this product is great for any level of player, junior to pro and people that enjoy tennis in their spare time. The main reason why i would use this product is because of the feel that I have on the ball, that translates in all aspects of my game, including my confidence to be more offensive and finish the point. The quality of material is solid and Pojie improves hitting the ball with less energy and more time to attack the ball.
" Finally tested the Pojie out for a few hours and I like them a lot. The effect is actually more pronounced than I thought it would be. This was using 2 identical racquets with Luxilon ALU Power at 58 lbs. Only difference is the Pojie installed on one racquet ( racquets right now are Wilson BLX Prop Open ). I could definitely tell that there was more "pocketing" on the Pojie racquet, and my balls had more power. I tried this as a blind playtest the best I could and identified the racquet with the Pojie in it right away. I will defintiely keep them in my racquets. Like I said, the biggest difference was what I described as an increase in pocketing, almost as if I had a slightly thinner gauge string in my racquet. " "I've noticed a big difference in my game after using the Pojie. Because of the bigger sweet spot it creates, I more often find extra pop in my shots, especially the forehand. The most noticeable improvement is I can actually hold the ball on my strings a bit longer which is the key to more power, spin, depth and control for any player. After using the Pojie for a few months, I played without them and I felt a big drop off in my shots. So I swear by those little guys now, because they work. " " Playing with the Pojie brought new energy and life to my prince Diablo, most noticeably hitting groundstrokes from the baseline. It helped me gain more confidence to take balls early and rip them back with better top spin because of the larger sweet spot. I also ended the season with my first singles win. I'm happy to have this weapon in the arsenal." " I have an internet tennis shop and I introduced the Pojie in my range of products…some tests have been done and some reviews start to come from customers. All I have to say is that 100% of my customers are satisfied with Pojie. More often, my customers order one Pojie to test it on one of their rackets. Most of the time, I see them one week later to order as much Pojie as their frame because it becomes impossible to play without Pojie ! " " I enjoy trying new products, so when I came across Pojie I was instantly intrigued as I understand the benefits of longer mains in a racquet in creating a bigger feeling sweet spot. Pojie unquestionably enlarges the sweet spot of the racquet." " I immediately noticed a difference! I ordered some, and strung my own racket. I love them! I am 74 years old, and want to maintain a strong game. The pojies give me extra snap on my serve, and a great feel of acceleration and control on my favorite shot, the forehand. It's a great product! " " I like the pocketing… you can almost feel it cradle the ball... the added weight works out for me. … at times it felt as though I were simply playing with loose strings… But I think if you hit through the ball and try for more spin on the follow-through the ball stays in the court with more power.The Serve seemed to have more snap and power … seemed that the pojie especially helps a lot with slices/ top spin serves … "
" I could never play with a poly string, now I do and my control has improved tremendously, I hit with more power and spin is great and I can play for hours." " Don't judge the Pojie on the first few tries.. It's a different feel and slight weight change..Once you adjust to the new feel...it becomes a dynamic change all in the right spots...I not only teach tennis everyday but I also play 5 to 6 days a week ...I use to break full polly every 3 to 5 days ...and the elbow always had a lot of tenderness...The Pojie has done the following for me...please remember the first few times I tried it I did not feel it was worth the expense...but its done the following. ..strings lasting 2 to 3 weeks...it elongates the strings seems to give me a more comfortable sweet spot ...the slight weight change puts the absorption and energy of the racket right where you need it....and its saving my elbow. ....I was a big skeptic I'm 52 and been involved with tennis for 38 year and have seen a lot of things come and go ...but the Pojie is here to stay it truly works , no one likes change , but if it can help the elbow, add a dynamically better feel on the racket and sweet spot and save the strings who would not want that added to there game and lifestyle….? " Pojie has really helped my game! My racquet's sweet spot has increased exponentially, I can feel the ball hanging on just a second longer to allow perfect ball placement. Best of all, my arm and elbow don't feel fatigued when I finish a match, so my topspin swing has improved as well. I would recommend the pojie to anyone who likes to play tennis.
" With the Pojie I have noticed that I am able to access more powe with less effort. My spin has also been helped. Being a lefty thay was a big advantage." " Pojies have really helped reduce my shoulder pain. I have also noticed increases spin and power on my strokes. The best part is the clients that I have switched to Pojies. They love them and have raved about them helping reduce their arm and elbow pain. I highly recommend them to everyone to help give them a competitive edge and save their arm, but if you have arm problems, Pojie's are a must have. " " I have been a USPTA Professional for 43 years and have seen a lot of changes in racquets, strings and accessories over the years. So, when I was introduced to the Pojie at the USPTA World Conference in September I was anxious to try them. I was pleasantly surprised that I got more power and control on my ground strokes and more pop on my serve. I have put them in the racquets of several of my students and team members and have had positive responses from everyone who has tried the Pojie. " Have you played with Pojie? We would love to hear more about you as a player and how Pojie has impacted your game by filling out our Player Profile form.